Unattractive, unsightful and painful varicose veins have previously been treated with “stripping or cutting” the veins, which often frightened patients into avoiding surgical treatment. Thankfully there is new kid on the block for treating varicose veins - the VenaSeal Closure Procedure producing good cosmetic results. Dr Velu is proud to offer the latest VenaSeal Closure Procedure, which may be the answer to providing you with relief you need with little to no downtime and significantly reducing the need for compression stockings. The VenaSeal Closure Procedure is an innovative and alternative treatment option for venous insufficiency. What are Varicose Veins and Venous Insufficiency? Varicose veins are abnormally dilated veins in your legs which are often caused by incompetent deeper veins in your legs. This incompetency leads to back pressure, which results in the bulging, twisted veins you can see on your legs. There are many causes of venous insufficiency including smoking, age, being overweight, gender, lack of exercise and family history. Varicose veins and venous insufficiency (VI), or chronic venous insufficiency (CVI) is a condition that occurs when there are longstanding high-pressure changes in the veins causing reflux (reverse flow). This abnormal flow in the wall and/or valves in the veins prevent blood flowing back to the heart efficiently causing blood to “pool” in the veins. These prolonged changes can lead to varicose veins, venous ulcers, gaiter area pigmentation, leg and/or ankle swelling, fluid retention, leg fatigue, varicose eczema and a painful skin condition called Lipodermatosclerosis. As well as being unsightly, varicose veins can cause aching and discomfort and for women, pain during their menstrual periods. 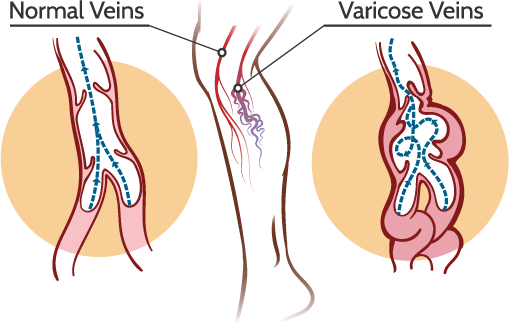 Fortunately, venous insufficiency is fairly easily diagnosed and treated by Dr Velu, your Varicose Vein Specialist. There are many treatment options available including amongst others, the latest marginally invasive technique – the VenaSeal Closure Procedure. The VenaSeal Procedure offers a comfortable and fast recovery option for suitable patients. VenaSeal works by delivering a medical adhesive directly into the affected vein using ultrasound guidance and applying pressure to close off the blood supply to the affected area. Once the damaged vein is closed, blood is distributed to healthy veins. The VenaSeal Procedure is done as a day procedure in hospital and takes approximately 45-60 minutes, however normal post-surgery protocol applies, and the average time spent at the facility is 4-6 hours. mild pain for the first few days - this indicates that treatment is working and should subside within a few days. Pain can be managed with walking, or by taking Panadol or Nurofen. itching over treated veins - treatment with antihistamines or steroids can help as prescribed by your Doctor if severe. Vein inflammation may occur for a few weeks post-procedure and should subside within 4-6 weeks. This indicates that treatment has been successful. Although uncommon, recurrence can occur, and further treatment may be required. As with all other varicose vein treatment there are some possible adverse side effects of VenaSeal treatment. Serious complications though rare, include allergic reaction which may require anti-inflammatories and time to settle, or deep vein thrombosis and pulmonary embolism however this is extremely rare. If you develop such symptoms, report them immediately. VenaSeal studies have shown faster improvement in patient’s symptoms, lower pain rates and minimal bruising and complications. If you would like to learn more about the VenaSeal Procedure and to see if it’s suitable for you, make an appointment today to see us. See your personal GP for a referral today!